British tourists caught up in the 6.9 magnitude earthquake in Lombok, Indonesia - which killed nearly 100 people and left at least 20,000 people homeless - have been speaking about what happened. "It was just horror, people were screaming, people had shards of glass stuck in their legs, all the staircase had gone," says Luke Turner, who was on the third floor of his hotel when the earthquake struck. 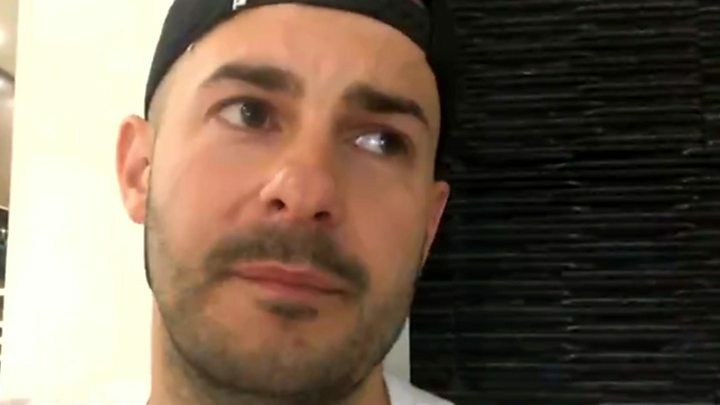 Mr Turner, who had travelled to the country for his honeymoon, told the BBC's Victoria Derbyshire programme that everybody "just helped each other" in the aftermath. 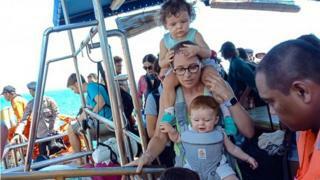 Thousands of tourists have been pictured flocking to the beach to be evacuated from the Gili islands, which are situated off the north-west of Lombok and popular with backpackers and divers. Some have described waiting on the beach for nine hours to get on a boat. Mr Turner says there were "still hundreds of British citizens and European citizens" stuck in Lombok airport, but he and his husband managed to get a flight to the Indonesian capital Jakarta. "The flight was just awful. There were locals that were on there to flee the island that were in floods of tears," he says. He said they had experienced 14 aftershocks in 48 hours. Matt Roche, a 27-year-old tourist from Country Durham, was on holiday in Bali with his girlfriend, Lesley, 30. The self-employed bricklayer said: "Whilst having a drink, my girlfriend felt something and looked over at me and said, 'is that an earthquake?' - she was here when the one last week struck. "I replied, 'no it can't be', then looked up and saw all the lights in the bar shaking violently. "As soon as the Balinese staff started to scream and run it hit me that it was, so I jumped up, grabbed my partner and ran into the street. "I then lost her briefly in the crowd and when I found her I made sure we kept moving away from power lines and high buildings to be safe. When we have been out today we have had to take different routes because of bridge collapses. "It does strike fear into you, obviously total panic from everyone around you running and screaming, even though it's over." British tourist Julie Silvester filmed the aftermath of the 6.4 magnitude earthquake in Kekalok village. She said people's homes and livelihoods were "damaged beyond ruin". 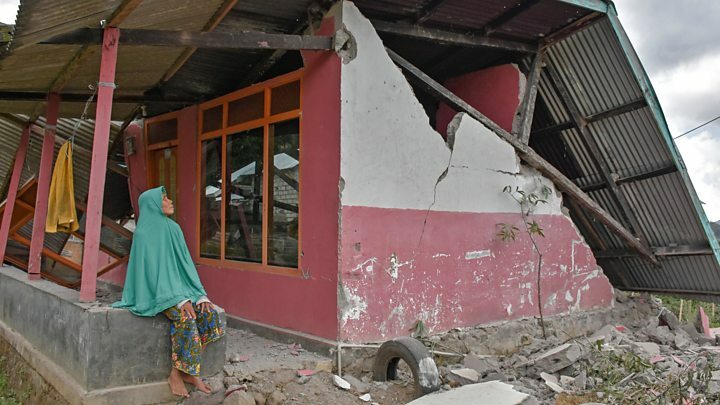 The UK Foreign Office said it was working with the Indonesian authorities to provide assistance to British people caught up in the earthquake. Extra flights are being added to help people who want to leave Lombok, a spokesperson said.